Comfortable eartips for clear sound transmission. Professional stethoscope attached to cuff. Easy to squeeze bulb. Professional gauge with large black numerals. Adjustable D-ring cuff. Durable latex inflation system. Why should I monitor my blood pressure at home? A single measurement at the doctor's office may not be enough to determine your true blood pressure. That's why monitoring your blood pressure at home is such a good idea. Regular home monitoring lets you supply your doctor with a record of your measurements over time. This information may provide a better idea of what your blood pressure really is, and can help your doctor make important decisions about your diagnosis and treatment. Remember, only your doctor is qualified to interpret your blood pressure measurements. Your blood pressure monitor is for personal use only and is guaranteed to be free of defects in materials and workmanship for a period of one year from the date of purchase. 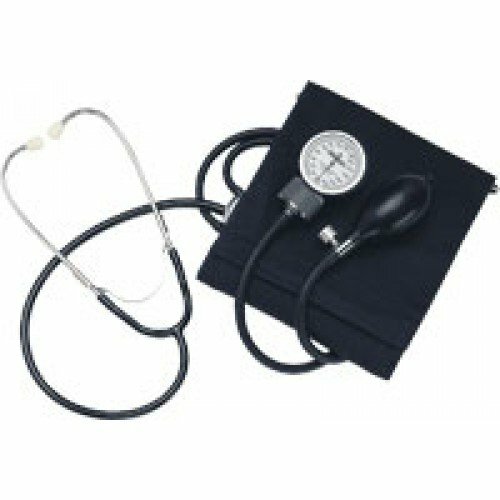 Contains: 1 no stop pin gauge, 1 self taking cuff with attached stethoscope (fits arms 9 inches to 13 inches in circumference), 1 illustrated instruction manual and record chart, 1 storage case.